This Revelation13.net site discusses prophecies -- New age, Biblical, Nostradamus, and Astrological -- in attempting to predict future world events. Associated with Catholic prophecies are sightings of the Virgin Mary, which have been occurring with increased frequency in recent years. In Milton, Massachusetts, beginning in June 2003, an image of the Virgin Mary and Child was noticed in a window at Milton Hospital in Massachusetts, south of Boston. It has gained international publicity. See this page for more on the Milton BVM (Blessed Virgin Mary) image. And a BVM was reported at Sacred Heart Church in Medford Massachusetts in March 2004. 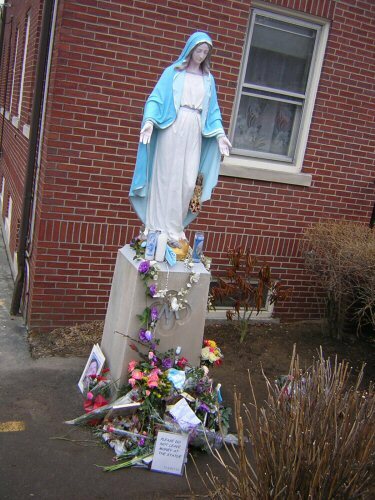 This BVM was in the form of a Virgin Mary statue outside this Catholic Church, that was seen weeping. 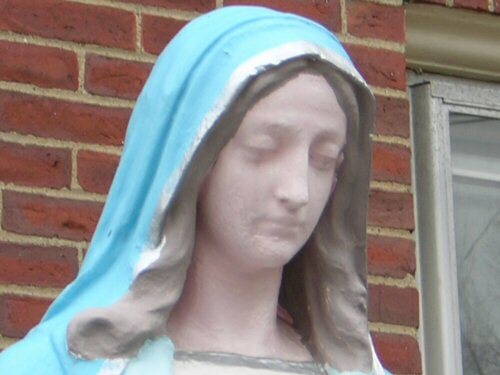 This church was then set to close soon, (and did close in July 2004), and the crying statue shedding tears was believed by some to be related to the church closing, the Blessed Mother crying over that and the scandal that has rocked the Church in recent years. Crowds started showing up to see the statue on March 3 2004. 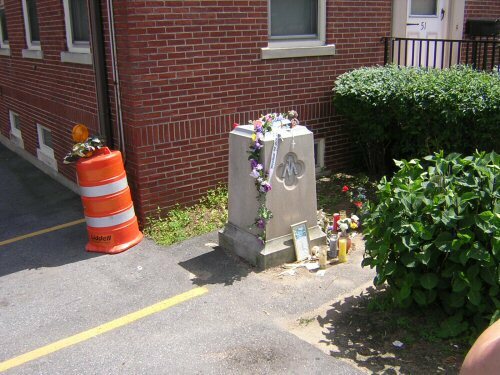 Shown below are photos of the statue, the Sacred Heart Church which is near Tufts University, and also photos below of Mystic River which goes through the city near the church. Note that the movie "Mystic River" was a popular movie in 2003. 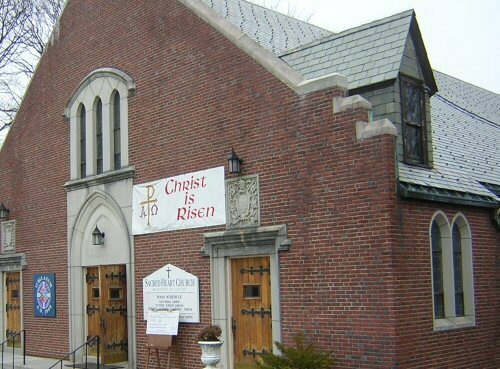 Note in one of the photos the "Alpha Omega" symbol for Christ, and the "Christ is Risen" sign, on the front of the church. 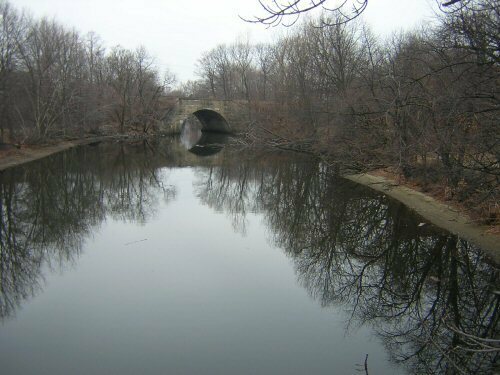 Also, the Medford area has become a popular location for pagans and witches, with the parks along the Mystic River popular spots for pagan worship activities; so this area may be an energy vortex. This may relate to the significance of this BVM. 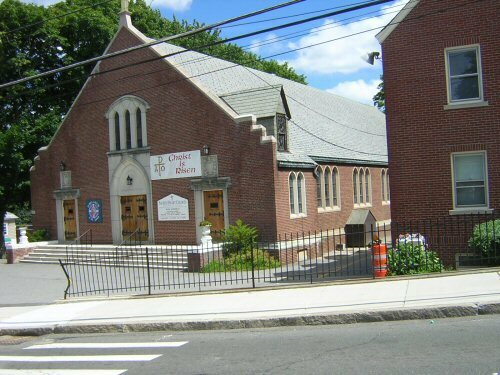 Also, it is interesting that this is the second BVM in the Boston area in a year. I did not actually see the statue weeping, but others claim to have seen it. The next two photos were taken on July 31 2004, a few days after the church closed, in the week of Boston's Democratic Convention. Note that the Mary statue has been removed.